President Trump apparently has decided that intervention in Venezuela’s agonies can help repair an image scarred by the government shutdown debacle. In recent days, he recognized an obscure, right-wing opposition leader when he declared himself acting president. Trump has blustered that “I am not going to rule out a military option.” Mike Pompeo, his secretary of state told the world’s nations to “pick a side” in the internal Venezuelan standoff. Trump is ratcheting up sanctions, increasing the miseries inflicted on the Venezuelan people. And most recently, he named as point person for Venezuela the notorious Elliott Abrams, ardent advocate of dictators and war criminals, a cheerleader for virtually every catastrophic U.S. intervention from Reagan’s covert war on Nicaragua to the Bush’s invasion of Iraq, and a convicted perjurer (withholding information about the Iran-Contra scandal). This is like putting Al Capone in charge of enforcing law and order. Venezuela is in deep crisis. Inflation is soaring, the currency is in free fall, corruption is crippling. Oil—it has the largest known reserves in the world—is its blessing and curse. For decades, the rapacious elite pocketed the wealth, leaving the vast majority in poverty. When a popularly elected president, Hugo Chavez, took over oil production, redistributed land and provided greater resources for health care, food and housing for the poor, the elites sought to overthrow him in a 2002 failed coup — one the U.S. shamefully supported (including Abrams as a member of the Bush National Security Council). When the price of oil plummeted, the economy went into crisis; government mismanagement and corruption made things worse. Millions have fled the country. 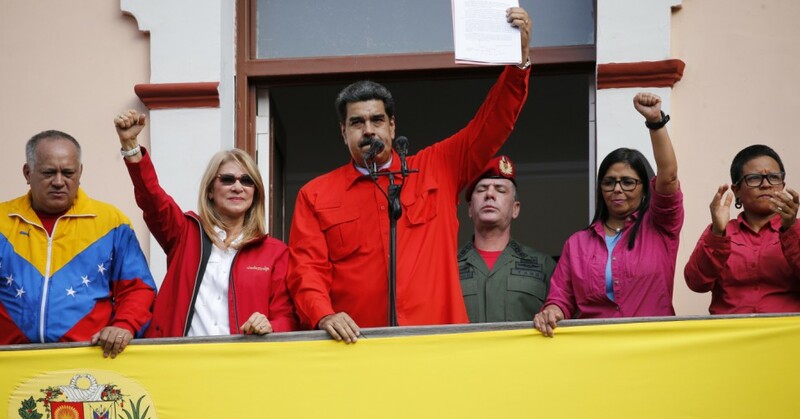 The opposition exacerbated the situation by refusing to recognize the 2013 electoral victory of Nicolas Maduro, sponsoring violent attacks, boycotting future elections and calling for military and foreign interventions. The agonies were worsened by U.S. economic sanctions, illegal under treaties of the Organization of American States and the UN. Now, the U.S., joined by a significant number of Latin American countries as well as an increasing number of European allies, is calling for Maduro to resign and for new elections. Abrams’ appointment signals that the pressure will be ramped up even more. Most likely, Trump will follow the textbook used in the overthrow of Chile’s democratically elected leader, Salvador Allende. Then U.S. sanctions were tightened to “make the economy scream.” Covert efforts were made to enlist generals to overthrow the president. The CIA helped fuel strikes and demonstrations from the opposition. The result was the Augusto Pinochet dictatorship that consolidated itself with savage brutality. The U.S. has a long sordid history of regime change—military and covert interventions aimed at overthrowing governments — in Latin America, a record that belies our proclamations about international law and a rule based global order. We would do well to avoid adding to that regrettable record. They called on the U.S. and outside countries to support negotiations between the government and its opponents, rather than to risk fostering a coup that might plunge the country into further violence. It is a time for diplomacy and for restraint, not another intervention that unleashes violence that we surely will come to regret. Jesse Jackson is an African-American civil rights activist and Baptist minister. He was a candidate for the Democratic presidential nomination in 1984 and 1988 and served as shadow senator for the District of Columbia from 1991 to 1997. He was the founder of both entities that merged to form Rainbow/PUSH.